Olivier-winning actor Mark Rylance writes and stars in an all-new play Nice Fish, fresh from St Ann’s Warehouse on Broadway. Set to open at the Harold Pinter Theatre, where smash-hit The Kinks musical Sunny Afternoon currently plays, critically-acclaimed production Nice Fish will receive its London premiere in November 2016. Set on a frozen Minnesota lake, two fisherman are out on the precarious ice, angling for answers to life’s larger questions. Whilst Ron is a playful novice angler who would rather build snowmen, Erik is a long-practiced fisherman with a sombre tone. As the two men drill holes in the ice for any hope of catching an unsuspecting trout, they begin to mull over their lives. 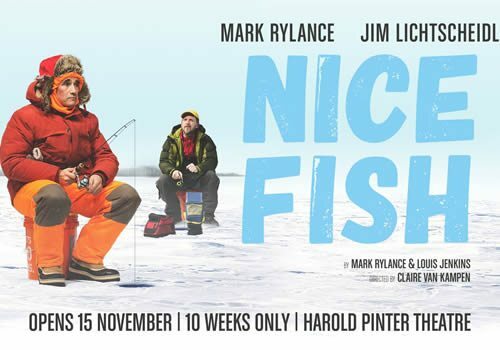 Based on the prose and poems of Louis Jenkins, Nice Fish is a new play written by Rylance and Jenkins which has been described as “whimsical and lyrical” (The Guardian). Multi-award winning actor Mark Rylance stars as Ron, in his first return to a London stage since the heralded Farinelli and the King. Rylance is well-known for his extensive stage credits, which have included his Olivier and Tony Award-winning performance in Jerusalem, as well as Twelfth Night. His acclaimed screen credits include a BAFTA and Academy Award-winning role in Bridge of Spies. Jim Lichtscheidl transfers with the production as Erik, alongside Kayli Carter, Bob Davis and Raye Birk. Directed by Claire van Kampen (Wolf Hall), Nice Fish features design by Todd Rosenthal. Adapted from poet Louis Jenkins’ Nice Fish, this production is a heart-warming affair which is sure to delight West End audiences. Nice Fish is recommended for ages 9 and up.